Mark Cline with one of his creations. Photos by Doug Stanford. 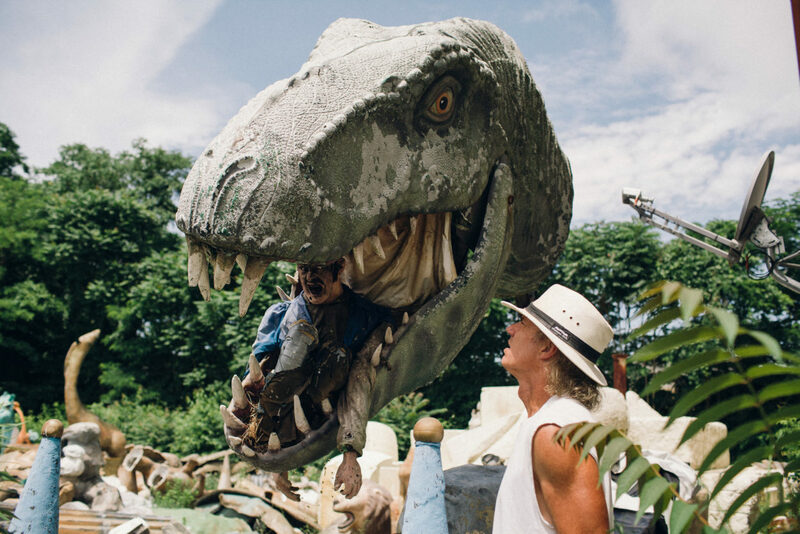 When you’re invited to visit the studio of Mark Cline, the man responsible for the sculpture-filled theme park dedicated to depicting an alternative, but way cooler, history in which the Civil War was waged not just between North and South but also man and dinosaur, you can't help but speculate about what you’ll see. I kept trying to temper my expectations, but that kid-just-before-Christmas feeling kept sneaking up on me; who knew what amazing sights waited for me when I finally got there? The excitement crept up another notch after getting off the phone with Cline, the artist, curator, construction foreman, and head visionary behind the attraction, entitled Dinosaur Kingdom II. “Just down the dirt road, you’ll see the giant wall. I’ll leave the gate open for you,” went Cline’s instructions. Giant wall? Foreboding gates? I was getting a serious King Kong/Jurassic Park vibe from the whole thing. Instead, when we got there, it looked more like a religious compound. The high, concrete walls formed a tight, rectangular perimeter which enclosed a grass courtyard, mostly hidden by the half-opened wooden doors. Tall, grey, and replete with “do not disturb” signs and a large painting of the Ten Commandments on their stone tablets, the doors looked like they belonged somewhere a little less fantastic, and a little less inviting than the Wonka-esque monster repository that I’d been imagining. I squeezed the car through the doors and into the courtyard. I took a few seconds to absorb it all. It turned out all of the King-Kong and Jurassic Park-esque goodness was on the inside. The compound had two major buildings: an office and a large work station. Tucked into every other available spot were fiberglass sculptures. Dinosaurs, animals, monsters, robots, and giant ants littered the area. Some lay on their sides while others were piled in heaps. Some stood posed as if trying to be noticed amongst the rabble. Occasionally, statues were positioned so close together that you couldn’t help imagining stories about them: “The robot and the ogre are in love, despite what their parents think.” I turned to my friend Doug, who was there to snap photos. Between camera clicks, he smiled and said, “This is already so much better than I had hoped.” He was right; it was spectacular. Mark Cline had made it, and Mark Cline is an entertainer who knows how to make some serious props. Mark Cline at work. Photo by Doug Stanford. After a few more minutes of scoping out the scene––my favorite item was an animatronic raptor with inner gears and wires exposed––Cline’s truck rumbled up and he jumped out. Tall, long-haired, and tanned, with the type of muscles that come from hard work rather than from working out, Mark exudes two immediately recognizable qualities: a magnetic desire to make people smile and a seemingly endless supply of energy. “Two things about me,” he said as he steered us towards his work space, “I go fast and I never go backwards, so you’ll have to keep up.” With that, he was whipping around his studio, showing us storyboards of Dinosaur Kingdom’s various installations, guiding our eyes across maps of the land the park is built on, gathering tools, and preparing pieces for transportation. As he worked, he narrated what he was doing, why he was doing it, and how the work tied into his park. Cline may be a natural entertainer, but he’s also honed the craft over years of practice, so he was comfortable having an audience. He shared his work history, clued us into how he built his styrofoam and fiberglass monsters, and provided insights into what drove him to build his creations, all while going about the urgent work of the day. Dinosaur Kingdom II was supposed to open the week prior to our visit, but severe weather had made that impossible. Now, Cline was determined to open in the first weeks of July, no matter what. It left very little time for dawdling or distractions. Despite the time crunch, Cline was happy for us to shadow him for a few hours so long as we managed to keep up. Like he said, Mark Cline moves fast. Cline has been building sculptures for decades; his first big piece was commissioned for a haunted house in Virginia Beach. Later, he had the opportunity to build new displays for Winchester, Virginia’s Dinosaur World, a nice bit of circularity since it was the same Dinosaur World that inspired a nine-year-old Cline to declare to his father that he would be building monsters for a living. Cline made his first successful piece long before he was paid to build for dinosaurs parks and haunted houses. In 1969, a blizzard hit his hometown and the following days saw a population boom of snow-people. Cline, then eight, chose to forego the traditional snowman to build a snowy Statue of Liberty. In a town full of snowmen, hemade the only snow-person with a touch of femininity. The distinction earned Cline a photo in the local paper. When school reopened, he received excited congratulations from friends and faculty alike. The positive attention in school was a rarity. Diagnosed with ADHD concerns and placed in one of those spirit-grinding alternative classrooms for slow learners, Cline was desperate for the sort of attention his snow-woman had provided him. He learned from the experience that with some hard work, daring, and a commitment to being a little weird, he could channel his energy and shut-off-switchless imagitionation into the positive recognition he’d been so desperate for. If you were ever looking for an analogy to explain the overarching mission behind Cline’s work, his courtyard purgatory is it. Everything can be repurposed; nothing is ever so far gone that it can’t be healed and made whole again. Ask Cline why he chooses to create such works and he’ll reply that it’s, “all about the healing.” Even his more gruesome displays were made in the hopes of giving someone a little convalescence. Cline knows the value of healing better than most; he has had some healing of his own to do. The doubts he faced in grade school continued long into his adult life, and much of his early career involved being told it was time to quit and get a real job. Even after his work began to gain traction, Cline had to sacrifice time, money, and a marriage in order to turn his visions into reality. So, he makes monsters in order to make other people laugh, and when they do, both he and his audience get a little closer to feeling whole. Through his work, Cline meets soldiers coping with injuries, children mired in imagination-draining classrooms, and every other manner of person dealing with their own personal trauma. No matter who they are or what they’re facing, most find something in the art to bring a smile to their lips and some healing to their souls. In accordance with his philosophy of healing, Cline didn’t view the 2006 fire which ended the first Dinosaur Kingdom as a setback, at least not an incapacitating one. Instead, Cline called it a blessing in disguise and used it as a chance to to fix some of the aspects of the original park that he was dissatisfied with, and build on his original vision. Ever since, Cline has been tirelessly healing his displays, preparing them for re-opening. The results are spectacular. Spare parts and new creations. Hidden behind a wall of telephone poles sharpened to look like stakes––there’s that King Kong vibe again––Dinosaur Kingdom II features a dozen displays depicting various scenes of dinosaur and human mischief, with a few slime monsters thrown in for good measure. You can find Abe Lincoln lassoing a pterodactyl as it tries to fly off with the Gettysburg Address. Elsewhere, an herbivore is being retrofitted with a pair of Gatling guns so that it can be used as a living weapon. One of the first scenes a visitor will come across is the severed foot of a dinosaur who had been caught in a bear trap. A few twists down the wooded path reveals the dinosaur exacting his revenge on the hunter who laid the trap. Not all of the displays at Dinosaur Kingdom II are violent. Some are of peaceful interactions where docile dinosaurs and respectful humans coexist. These were my favorites. Don’t get me wrong, seeing Civil War soldiers cowering in a sinkhole while a pack of raptors sneak up and encircle them is pretty awesome. But I prefered the scene of a young farm boy dutifully milking a stegosaurus while her baby patiently watched and waited for its share. Cline is purposefully coy about the stories in his park; he even tries to obscure his human characters’ faces so that their feelings are a little more ambiguous. That way, his audience has to fill in some of the gaps for themselves and can create their own narratives. So here’s my take on the milking scene: It must have happened after the Civil War, one of the bloodiest conflicts in our nation’s history, when man and dinosaur could finally leave the violence behind and return to their blessedly peaceful existences. It’s a depiction of healing after a national trauma. Mark Cline could tell you how important that is.